Successful Endeavours was again nominated as finalists in four categories at the 2016 PACE Zenith Awards. The nomination categories were Power & Energy Management, Best PLC, HMI & Sensor Product, Water and Wastewater and Best Network Implementation with two nominations in the Best Network Implementation category. 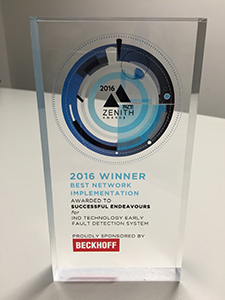 The winners of all categories were announced at the awards presentation on 11 August 2016 with Successful Endeavours winning Best Network Implementation for the IND Technology Early Fault Detection System. Read about these awards and the winners in our blog post: PACE Zenith Awards Winners 2016.